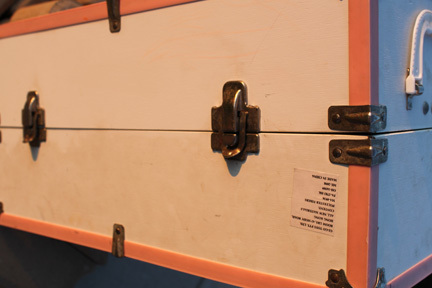 If you are a thrifter, junker, or vintage treasure hunter you will find you need some secret weapons. One of mine is this not so secret tool in my arsenal. Yes, it is Mr.Clean Magic Eraser. I can’t do my magic without it. When you thrift or junk you come across all kinds of items in different states of cleanliness. Some people have spotless items and others, well, not so much. There are a lot of things a bucket, old rag, and soap will clean. However the Magic Eraser works its magic like nothing else on some spots and marks. Take a look at this. The top has been cleaned with Mr. Clean and the bottom with just soap and water. No comparison. Yes, this trunk was even more filthy than what the bottom looks like. Soap and water did a lot, but painted word can only be cleaned well with my buddy, Mr. Clean Magic Eraser. 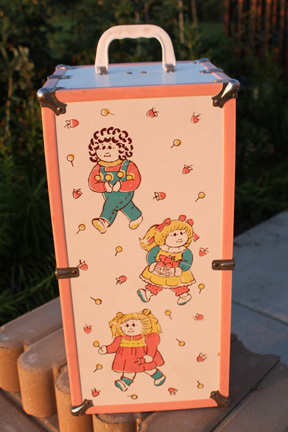 Now just in case you want to see what this treasure was that I found recently, it is a Gi-Go Doll Trunk. So cute once it was cleaned up. Mr. Clean can work its magic on all type of materials. 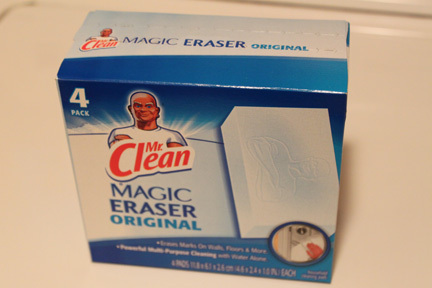 Do you use the Magic Eraser? Do you have secret weapons in your stash of tools to help you with cleaning your treasures? Would love to hear.